I've got to be honest--- I hate altering patterns.The internet has been a huge help in this because back before there was so much information on the web (You Tube, bloggers, etc.) there were books, but you had to own them. I can't say much about this though because of my young life....But I have to say, there is one book that I am so glad I found: Palmer Pletsch's Real Fit for Real People. This book has real people and real situations that I really help me! Pamela's Patterns are based on many techniques taught by Palmer Pletsch. If you feel as though your armholes are usually too long for you, you may need to alter the armhole size. I'm not even going to show you how to do this because Pamela has an excellent video on how to do this. Next thing you will want to do is choose your neckline. There are four different options included in this pattern--- a scoop neck, jewel knit, jewel with a keyhole front and a scoop with a keyhole back. Plus, if you own Pamela's Patterns, "The Perfect T-shirt" or "New Necklines and Sleeves for the Perfect T-shirt", then you can use any of those with this pattern too! If you choose the scoop neckline, keep reading. If you choose any of the others included with this pattern, you can start cutting out your pattern according to the directions! 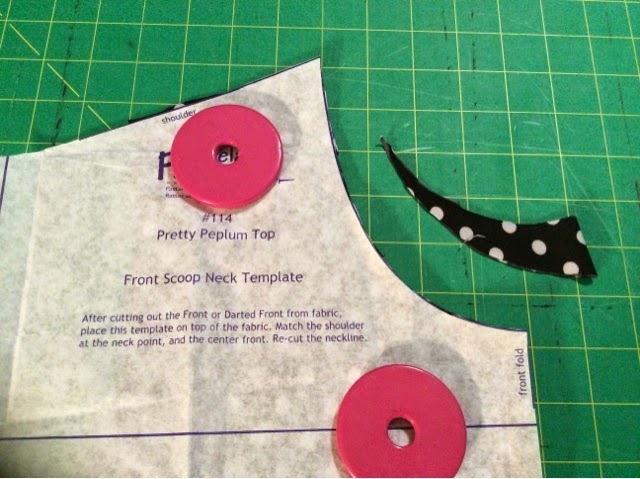 After cutting out your bodice pieces, keep the front bodice folded. 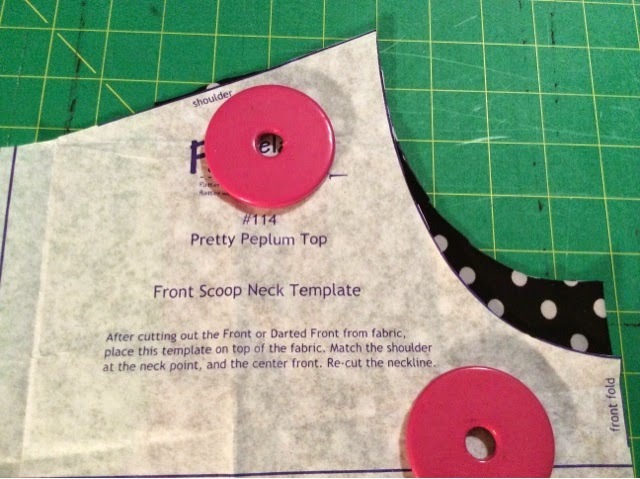 Lay the Front Scoop Neck Template over the neckline, lining up the shoulder and front fold. Cut off the excess fabric above the line. There you have it! Now you're ready to sew! Don't spend a lot of time trying to get everything lined up and square. Many times selvedges are not straight. Knits are forgiving and do not necessarily have to be laid out as accurately as woven fabrics. Make sure the greatest stretch goes around your body. Don't let knits fall off the edge of your cutting table. They will pull and drag the fabric into different shapes. If possible, cut the fabric using a rotary cutter and use pattern weights to hold the fabric down. It saves a lot of time and is much more accurate. Pamela has created a fantastic list of 10 Tips for Making a Beautiful Knit Garment. You can find a printable sheet HERE. 2) Cut out your knits with a rotary cutter and weights. Your cutting will be much more accurate. 5) A 4-thread serger stitch is the best for seams. Use a little differential feed to keep the fabric from stretching. 6) Always press armhole seams into the sleeve using a dressmaker's ham. Don't let the iron actually touch the fabric -- use the steam, heat and your hands to do the work. 7) Check your fit as you sew. Don't assume it will fit the way you like! Adjust your pattern to make the next garment even faster to make. 8) Three ways to hem knits: - slight zig-zag stretch (width 1.0, length 2.5) - 4.0mm double needle (stitch length 3.0) - coverstitch with a little differential feed. TIP: Be sure to lighten the foot pressure if possible! 9) Block necklines and hems. Without this step, they will look stretch. Invest in a good iron and point presser/clapper. 10) Don't be afraid to play around with the style. Knits are ever so forgiving! Cut out your pattern and please share your questions with us! Pamela will be able to answer your questions too, just give her some time, as she's not sitting watching the blog as people post! The next post will be shown on Monday, February 9th. We will talk about stay tape and do a little bit of sewing! LOL, I was working with a muslim for this top, and made exactly the same mistake - used the regular front piece instead of the one with darts, and I'm right at the 3" difference also. I DEFINITELY needed the darted front. I will need to raise the dart a little bit to improve the fit, but that shouldn't be too hard. I'm interested in why you noted to use stretch and not ballpoint needles? Do you always use a little differential feed when using a coverstitch to hem knits? I have a coverstitch machine but I'm still quite new with it and would love to hear any information about using it to the best of its abilities. I'm sure that I am not! LOL! I clicked on the links and saw Pamela's 10 tips for knits, and it included that she loves Isacord thread. For any knits? One of the many areas I need to learn more about is when to use different types of thread. I have a little bit of Isacord, but mainly just use Gutermann. I thought that at 40wt the Isacord was mainly for embroidery? Any information about choosing between different thread weights would be greatly appreciated. On ballpoint needles -- Ballpoint needles will work fine, but were developed back in the 70's when all we had was poly and cotton. Stretch needles are more refined for the knits we work with today, most of which include spandex. About the differential feed -- Differential feed will be your best friend when hemming with a coverstitch! Try a sample and increase the differential until the "sea serpent" hem lies flat. About the thread -- Isacord thread was developed for machine embroidery, but actually works great for sewing and serging! Since I wrote those tips, there has been a new cone thread introduced that I absolutely love - Aerolock by Madiera. This is super smooth long staple serger cone thread. Thanks for talking about this - I need to update the Tips sheet! If this posts twice, I apologize. Thought I wrote something, but then it disappeared. I don't own a rotary cutter or mat, but Jo-Ann's has 40% off on both this weekend. What do you recommend? Annie, I usually purchase Schmetz brand needles and they have both a "jersey" and a "stretch" needle. I have used both of them and the results were the same. Altering patterns is also my least favorite part of sewing. 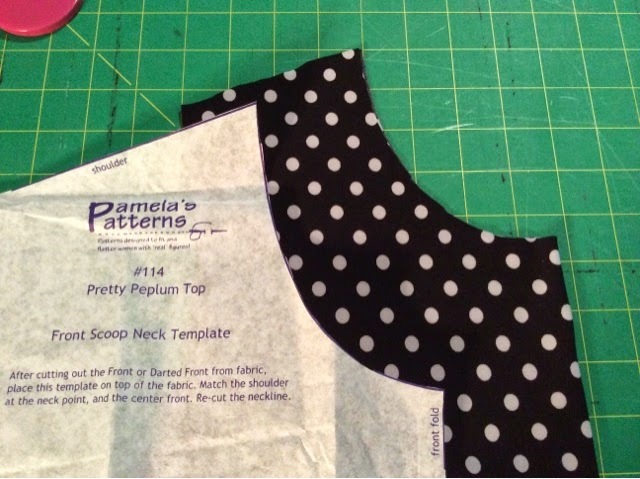 Recently I made the Pamela's Patterns Tank Top (#108) and the fit in the shoulder and neck is great! I used the darted front pattern piece, however, I would still like more ease in the bust area (I'm 38DDD). Since I'm assuming the peplum top will fit the same, is it better to do more of an FBA (full bust adjustment) on the front pattern piece or use the multisize cutting lines to get more ease? Hi Nadalynn, I sent this question to Pamela and I will post her answer as soon as I receive it! If you only need a little extra, add 1/2" extra seam allowance to the side seam of the front only. Otherwise you may need to do a bit more of a full bust adjustment. Let me know if you need any help with this. Thanks for your response. I decided to do a FBA of 1" and also shortened the armhole. I think I'm going to be happy with the fit! I want to make this as a dress - do you just lengthen the peplum by extending the side seams or do you cut peplum in half crosswise, lengthen, and redraw side seams so as not to add to much fullness at the hem? Thanks for your input as to which is the better way to go about this - or is it more of a personal preference as to how much fullness you want at the hem? I will be showing you how to make it into a dress version after we have the basic top taken care of. Stay tuned! Where do we buy the pattern from? As for not having a serger, no worries! You don't need to have a serger to make the pattern. Use a straight stitch with a modification of a slight zig zag, or if you have a stretch stitch on your machine that works too. You can finish the edges with a zig zag stitch if you would like.